Judith Thompson doesn’t exactly write what you would call “light-hearted” fare, despite what the title Perfect Pie might entice you to believe. Taking over Arts Court Theatre only until March 18th, Cart Before the Horse Theatre serves up some highly charged performances that give way to the moments of deep intensity that are characteristic of Thompson’s text. As part of TACTICS’ second season, Perfect Pie, directed by Paul Griffin, is a commendable production that is worth seeing. I’m always a little hesitant writing plot synopses as the fear of giving away too many spoilers is a constant worry. This piece is no exception, and if you truly desire a full synopsis there is certainly one that could be easily found on Google. 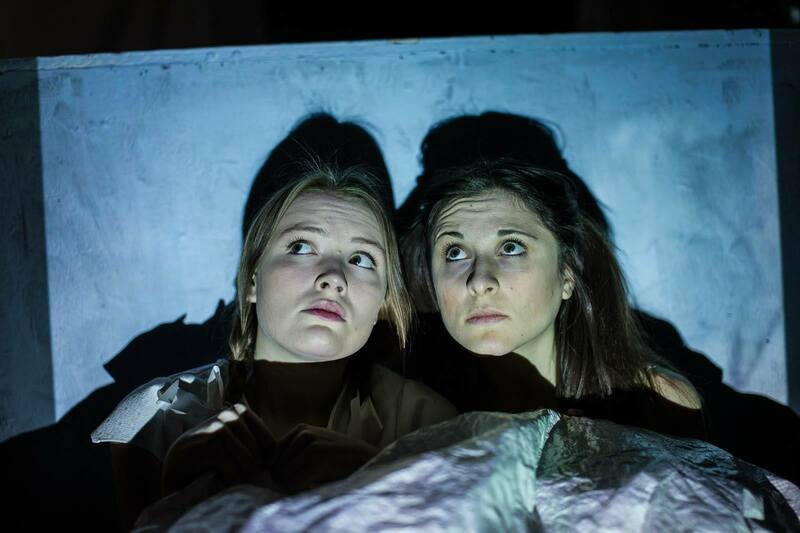 The themes that this piece deals with, to briefly mention, are mainly explored through the intra-female relationship between characters Patsy and Marie/Francesca. We watch as both characters struggle for acceptance simultaneously as young girls and grown women and further how childhood and the nature in which we grow up plays a profound role in how we see ourselves (and self-individualize) as adults. Moreover, Perfect Pie can be seen as a commentary on the lasting effects of violence by means of child abuse, bullying, and sexual assault. Every inch of the stage itself (also designed by Paul Griffin) appears to be in use, with an all-white aesthetic that undoubtedly triggers thoughts of purity and innocence; yet, when one considers the other side of the coin, the use of white can signify death as well. Two large white tarps fill the entire the upstage area, split down the middle to allow for the performers to enter and exit the scene. The tarps become the backdrop for a series of projections whose significance remains largely unclear (more on that later) and also act as a canvas for some beautiful shadow play. The sound, designed and composed by Martin Dawagne, accompanies this particular text well and helps to underscore the many ghosts haunting both Patsy and Marie/Francesca. Despite a few technical mishaps on Saturday night’s performance, the audio is very useful in creating a lot of the atmosphere and tension in some of the more intense scenes, such as when Patsy falls into a seizure. Moreover, the looping (or was it an echo?) sound effect used during the shadow scenes with the little girls is very compelling to watch. The performances, however, are easily the strongest aspect in this production. The first act is, admittedly, a little rocky at the start and the decision to have the actors playing nine year old children in a hyper-realistic style is jarring to say the least. This can be especially noticeable as Erica Anderson’s version of young Patsy appears to live in a completely different theatrical genre than that of her counterpart Megan Carty, playing Marie. This production really picks up pace, though, towards the middle and carries the energy right through the second act and all the way to the end of the piece. Gabbie Lazarovitz as Francesca does a great job at embodying this strong independent woman and displays excellent timing when it comes to revealing the ultimate cracks in this character’s façade. Her affected tone might sound fake or disingenuous to some, but I think it makes sense in this piece where Francesca has made (and continues to keep up) a deliberate effort to erase her past- or the “Marie Beg stain”. Whereas Patsy’s vernacular and intonation is evidence of her country upbringing, Francesca’s is a clear attempt at adopting what she believes to be the more sophisticated tonal qualities of the city. No, not everybody who’s from Toronto sounds like Francesca, but this is not the point of the affected tone. The new accent, along with both the name change and change in locale, helps solidify Marie’s new identity as Francesca. Playing the elder Patsy is Sheena Turcotte who is a real breath of fresh air on stage delivering a performance with such an incredible honesty and intensity that, when combined, creates a presence on stage that is truly a force to be reckoned with. The most powerful moments, I find, bloom between Turcotte and Lazarovitz as their characters try and reconcile their respective histories with the different paths that past instances forced them down and how this came to ultimately affect their relationship. The underlying attraction between the two women is another compelling aspect to these characters and I think that Turcotte and Lazarovitz create believable chemistry between Patsy and Francesca/Marie without ever being completely explicit about it. This leads me back to the overall mise en scene of the piece. On one hand, Thompson’s text is delivered with much force via Griffin’s capable direction. On the other hand, aesthetically speaking, this production feels incredibly heavy handed in a couple of ways. The first concerns the incorporation of both video projections and shadow play. It is difficult to find a good reason why both are necessary in telling this story. The projections remind me of family home videos, but I still don’t understand what these home videos have to do with the universe of Perfect Pie where Patsy and Francesca’s family members are only ever mentioned in passing. The shadow play is definitely the more visually appealing of the two elements and the videos only serve to eliminate further opportunities to work with these shadows. The second instance concerns the decision to have adult actors (Carty and Anderson) portraying children in such a ham-fisted manner that it often times results in a huge disconnect between the flashbacks, with young Patsy and Marie, and the present-day interactions between Patsy and Francesca. I have difficulty understanding how this type of acting provides any real challenges for the performers on stage or offers anything significant for the adult audience to draw from. Besides, isn’t it irrelevant whether or not the performers pull off acting like a “realistic child” but more integral that we witness and grasp the initial sentiments that ground the roots of this particular friendship (which are not at all dependent on whether the spectator views the performer as presenting a legitimate nine year old or not)? It feels as though attempting to have grown women walk, talk, and dress like young girls keeps these moments from reaching the maturity inherent in Thompson’s plays. Judith Thompson’s work is not easy to pull off: its often visceral, deals with uncomfortable subject matter, and “embraces[…] subconscious elements of human experience”. Cart Before the Horse theatre, founded by Carty and Griffin, endeavours to “explore topics we are otherwise afraid to talk about” (show program 2016) and it appears Thompson is a natural fit. This team proves they can certainly hold their own when it comes to presenting more ambitious material and, other than a couple questionable choices in directing, delivers a nearly perfect Perfect Pie. 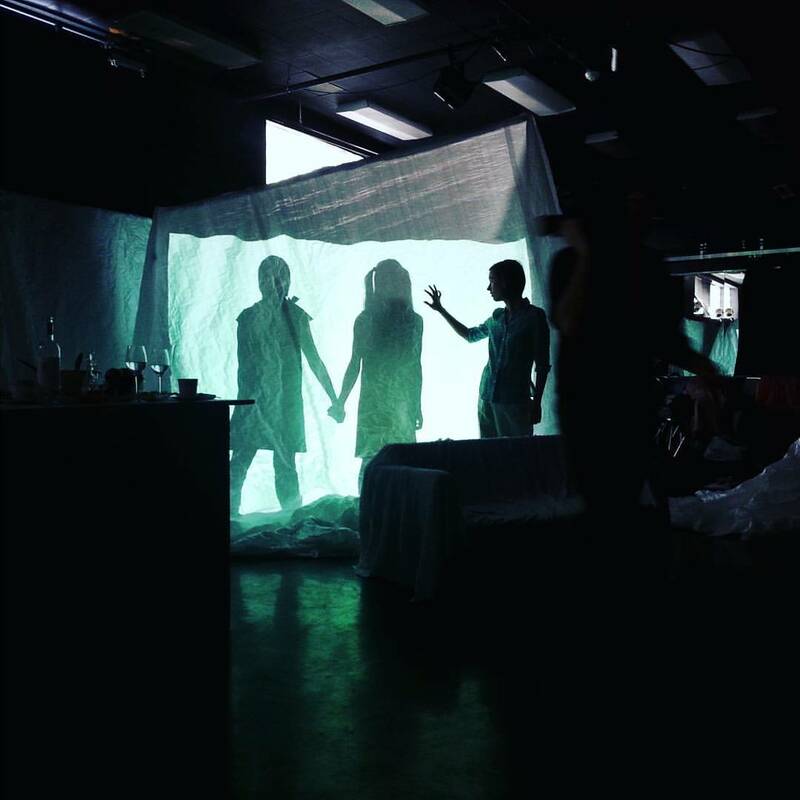 Le Long de la Principale and French-language Theatre: We’re Worth it Too!